Working at the Center for Sharing has been a blessing in so many ways and I am so fortunate that they came into my life at the time that they did. Before I got here, I was a mess. I had relationship problems and was in and out of jail. I had lost my apartment and my car was no longer running. I had a drug problem and then I found out I was pregnant. I ended up going to drug court and doing a year of treatment. I ended up getting a sponsor in NA, which was very good for me. She helped me think positive and helped me realize I can do better with my life. I was slowly doing better but I still needed help to get on the right path. I gave birth to my daughter in November 2016 and by January, I was searching for a job non-stop, without much luck. 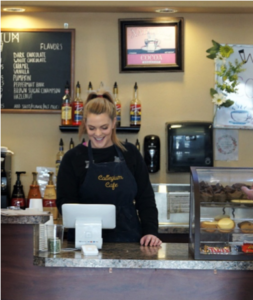 Through WorkSource’s Work Readiness Program I was placed into Center for Sharing’s work readiness program at the Collegium Café in Pasco. I was super excited to get a job even though it was temporary, I would be learning the necessary job skills for future employment. The first day working in the Café was a very different experience than at any other place of work. We would start our day with a daily huddle. Everyone got a chance to check in for the day and share how they are coming into work for the day. This helped me feel like they actually care about me and the things I’m going through matter. We have voluntary chapel at 9 am everyday Monday through Friday for 30 minutes to reflect and get closer to our team and God. We read a short message out of a book, reflect, and pray just to help get our day started. I felt like the more I was getting closer to God the happier I was with my life. Because of my growth and dedication to getting my life on track, I was offered a 6-month extension to stay at the Café and continue to work on myself and gaining job skills. I regularly participate in trauma and human development classes. I am learning to move on from my past and to be responsible. I am learning how to accept what is and to deal with the pain and challenges I do face day to day. They have supported me though my drug court and attended my graduation. By giving me the opportunity to work at the Café and live in Tierra Vida community I’m able to live a comfortable life where I can afford to pay my bills and raise my baby in a safe home. They encourage me to have goals and I have decided to go back to college. In fact, they offered me a second 6-month extension so that I can pursue my dreams of obtaining an education.